I got a new absurdly massive shower head and Alex took a… uh… “special” liking to it. Ahhh… if there’s one thing that is definitely missing from the India experience it’s good Tex/Mex. Once Zuko brought up burrito night I knew I had been craving it for months. Making our own tortilla chips and salsa isn’t easy, but damn is it worth it! We plan to have many more of these nights before he leaves. Went to my church today in Faridabad with Alex, Garland, and Saumya. Read all about it on Zuko’s blog! It’s a pain just trying to get normal household repairs done around here sometimes. Zuko was at my flat all day dealing with a particularly simple problem, that was actually made worse by the laborers sent to fix it. 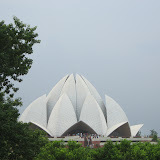 On Sunday Alex, Nelly, Saumya and I went to the Lotus Temple in Delhi. I have passed by it several times and seen it off in the distance many more – but have never stopped to visit. It really is an amazing architectural and spiritual feet, and was completed in 1986. Check out Alex’s pics (right), and read more about it on his blog.